FRIDAY, Jan. 12, 2018 (HealthDay News) — Your dishwasher may get those plates spotless, but it is also probably teeming with bacteria and fungus, a new study suggests. Microbes — from bacteria to viruses to fungi — are everywhere, including within and on the human body. So it’s no surprise, the researchers said, that a kitchen appliance would be hosting them. “The risk is probably in the realm of a shark attack,” she said. That is, most people face little to no risk, but there are select groups who may be at higher risk — in this case, people with conditions that weaken their immune defenses. Dishwashers are an interesting case when it comes to microbes because they are actually an “extreme” habitat, Hartmann explained. “People don’t think of them that way. It’s just your dishwasher. But it really is an extreme environment,” said Hartmann, who studies the microbiology of the indoor environment. Dishwashers create constantly fluctuating conditions — wet to dry, high heat to cooler temperatures, low to high acidity. They also harbor mixtures of detergents and dinner scraps. So, only certain microbes will thrive. Overall, they found, the most common bacteria included Pseudomonas, Escherichia and Acinetobacter — all of which have strains that are “opportunistic pathogens.” That means they are normally harmless, but can cause infections in people with a compromised immune system. The most common types of fungus were Candida, Cryptococcus and Rhodotorula — which also include opportunistic pathogens. 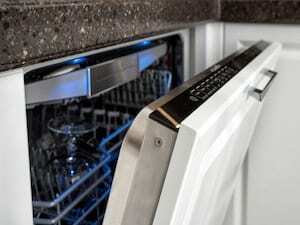 She said dishwashers and other microbe-hosting appliances are “generally safe” for healthy people. It’s “sensitive groups,” she said, who may need to be more cautious. And while that fungus is “hardly known in nature,” she said, it’s easy to find in dishwashers. However, Gunde-Cimerman stressed, that’s speculation. No one has yet proven a connection between dishwasher microbes and mycoses infections. How do fungus and bacteria get into dishwashers? The “main entry point” for fungi is the tap water that supplies the appliance, Gunde-Cimerman said. But food, people and pets are other potential sources, she added. As for the bacteria, the source isn’t clear, according to Gunde-Cimerman. “But we speculate that contaminated food is the main entry route,” she said. “Your kitchen might not be Yellowstone,” Hartmann noted. But, she added, it may host some “pretty amazing” microbes.